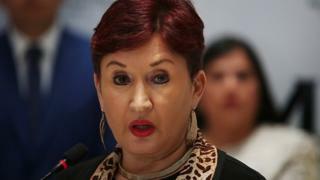 Ms Aldana was Guatemala's most senior prosecutor from 2014 to 2018. During that time she prosecuted and jailed the former president Otto Perez Molina, as well as other politicians, on corruption charges. The warrant for her arrest was issued by Judge Victor Cruz on Tuesday - the same day she was registered as a presidential candidate. It relates to a corruption inquiry involving illegal hiring, a Supreme Court official said. Police spokesman Jorge Aguilar said Ms Aldana was "currently travelling". "There is a migratory alert out because we know she is not in the country," he said. The UN backed calls for the removal of his immunity in order to allow him to be investigated. That move followed separate CICIG investigations into members of the president's family.